The past number of years, the news has been filled with accounts of girls or young women kidnapped months or years before and suddenly found alive, having been kept hidden and held hostage by their kidnappers. This is the best possible outcome for kidnapped children although the lifelong emotional toll on the recovered children has to be enormous. But every parent of a taken child must be desperate for such an outcome. 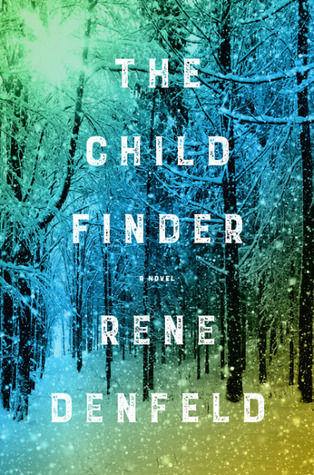 Rene Denfeld's novel The Child Finder introduces a character whose specialty is finding missing children, alive or dead, and this first book in a planned series starts off in a quietly spectacular manner. Naomi is special. Called "the child finder" by her clients, she specializes in finding kidnapped and missing children, never giving up and combing over scant information from every direction possible to help her figure out where the children must be. She agrees to take on the case of little Madison Culver, missing for three years, who disappeared at the age of five when in Skookum National Forest picking a Christmas tree with her family. She seemingly disappeared into thin air and no further trace of her has ever been found but her parents have refused to give up hope even as their own marriage cracks under the strain of not knowing her fate. As Naomi methodically tracks the missing girl, her own story as a missing child, one who escaped but was never reclaimed or identified, haunts her dreams. Her own trauma informs her search for Madison and her concurrent search for the missing baby of a developmentally delayed young woman who has been charged with the baby's murder. Naomi's own past, which is revealed to the reader in small pieces, informs how she goes about her work, antagonizing some people, pushing others, and only rarely opening up to anyone. She is clearly deeply affected by her own story, allowing her to connect with and have a surprising compassion for broken people even while she is uncomfortable around most folks. Interspersed with flashes of Naomi's past and her search, is a fairy tale of sorts. Calling herself the snow girl, a child tells herself the few small things she remembers of her life before being taken and what she knows and learns of the man with whom she lives. This latter piece of narration is absolutely gut wrenching for the reader but it is not horrifically graphic. Denfeld manages to create full and complex characters even in those only in the story for a brief amount of time, rounding them out as real and understandable in their motivations. Although this is billed as a thriller, because the narrative tension is steady and consistent it really isn't one. The story feels quiet, like it's muffled in the deep snow that quickly covered all traces of Madison's whereabouts when she disappeared. And although it deals with kidnapping and abuse, it somehow feels gentle and compassionate. At the end of the book, only one question remains, Naomi says that "it's never too late to be found" but will she be able to find herself over the course of the series? Thanks to the publisher for supplying me with a copy of this book.